A few weeks back, “Pulling Strings” demonstrated, for better and worse, just how difficult it can be to map out a single hour of witty, energetic capers like White Collar. Tonight’s exciting, frustrating, and high-stakes finale proves that the inverse—having a bigger picture in mind—is just as true. And to Jeff Eastin, Alexandra McNally, Channing Powell, and the rest of White Collar HQ’s enormous credit, “Judgment Day” helps imbue the roller-coaster series’ three-season timeline, and the fate of central charmer Neal Caffrey, with a real sense of consequence and forward motion. 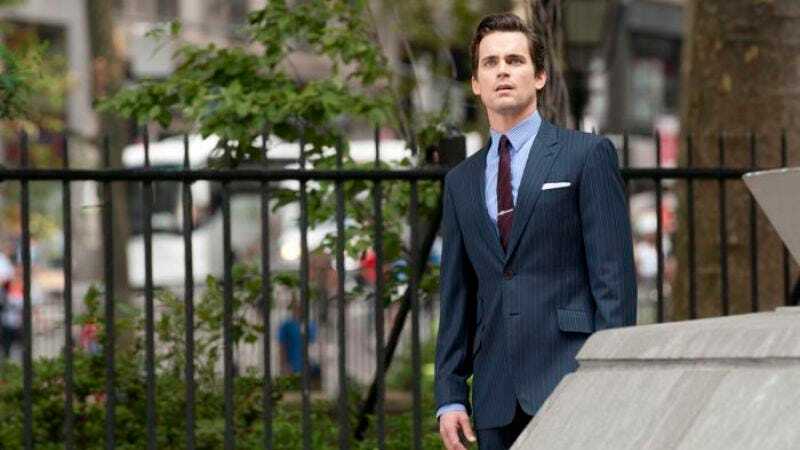 In other words, there may not have been a long-game from Day One, but for its 46th episode, White Collar connects the dots and outlines a scenario that could re-energize the series for at least three more seasons. The weekly cons have been hot and cold all year, so it’s refreshing to deal with the very simple matter of whether Neal will receive his commutation. Of course, as meddling Agent Kramer (Beau Bridges, at last revealing himself as a true villain) reminds Peter, nothing is ever simple. Soon, “Judgment Day” isn’t really about the drama of what a bureaucratic panel decides. As both Neal and Peter ultimately realize, and Jones reiterates while voting against Caffrey’s release, 24 months with Peter and the gang isn’t that bad, and maybe even worthy of some gratitude. Things only start to come unglued when pretty much everyone sees through Kramer’s plan to indict Neal on past crimes, extend his sentence, and move him down to the D.C. Art Crimes division, where he will essentially be Kramer's glorified superstar intern for the next quarter-century. Kramer’s motivation is dramatic. Sure, he got duped by his own inside man some years ago. And yeah, he’s an old curmudgeon who’s set in his ways and would rather entrap ex-cons to help recover stolen paintings than retire and mellow out. Still, Bridges is mighty convincing as a man unmoved by Peter and the department’s sentiment, and his transforming of Kramer into a snarling adversary is fun to watch. It’s also maddening, as well it should be. Overall, “Judgment Day” is a stressful and unpredictable escalation of tension and cunning one-upsmanship between and among cops and robbers. The centerpiece of all this is Neal’s efforts to reclaim the infamous stolen Raphael from a secret hiding spot on New York City’s isolated Roosevelt Island and deliver it to Sara before Kramer can catch it in his possession. Easy breezy, right? Until, of course, Kramer gets one step ahead and is waiting for Neal back on proper Manhattan ground. The ensuing 10 minutes are, literally and figuratively, the episode’s most precarious tightrope. On the one hand, shots from inside the gondola-lift-like Roosevelt Island trams are extraordinary, and flaunt White Collar at its location-scouting and creative best. On the other hand, we get our ludicrous base-jumping, curtain-swinging moment of season three when Neal leaps from one tram to another to reverse course and escape Kramer, and lands safely in front of what appears to be a blue screen from the set of the old primetime Batman series. In between all this inter-island commuting, not to mention sideways flashes of Elizabeth, June, and Jones’ commutation interviews (which were effectively distracting and suspenseful), Neal picks up the painting from a woman who was his apparent guardian till nearly 15 years ago, when he first went on the run. Something about that whole scene—the remote yet oddly floral setting, the unclear relationship between the enigmatic old lady and fugitive young man—reminded me of Tom Cruise and Lois Smith’s time onscreen in Minority Report. Then again, it also brought to mind Arnold Schwarzenegger and Danny DeVito meeting the woman who turned out to be their mother at a New Mexico art colony in Twins. Neither viewer nor Peter really knows the full story of the mystery woman who used to know Neal’s dad before he turned corrupt by the conclusion of “Judgment Day.” There’ll be more of that to come in season four. Their encounter is wisely used to drive home just how important a feeling of family and stability is to Neal, and that it’s worth fighting for. Although as we also learn by the sad, surprising last moments, he’s not willing to run in place for it either. That ending not only poked away at the show’s suggestion of moral ambiguity more intently than ever before, but flung the door wide open for White Collar to virtually reinvent itself when it returns by resetting all the characters to where we essentially discovered them in the pilot. Except both they and us have had two and a half years since to get acquainted with how much grey area there is within life and the law, and what seems fair and just for Neal. Yes, it’s frustrating and maybe even cliché to end on an unresolved cliffhanger, but for the first time in White Collar’s run, it’s worth it when the stakes feel this real. Neal’s middle name is George, and St. George is the subject of Raphael’s painting. By George, maybe they’re trying to tell us something. The commutation interviews kept reminding me of a bizarro version of the Seinfeld finale. Man, Neal really is just a lost inner child, huh? 19,364 Main Streets as of six years ago. Interesting. Those generic New Yawk construction-worker accents. Oy. Seriously, I can’t thank you guys enough for your enthusiasm, as usual, while following along with the season and these reviews. To paraphrase a famous, oft-repeated expression: you guys are the reason I get up and go to work every day. See ya for season four!